In the autumn half term Year 12 students were invited to be the ultimate risk-takers on a pilot programme with the British Exploring Society and the Jubilee Sailing Trust: Infinity. On this nine day joint land and sea expedition students challenged themselves physically and mentally, also supporting fellow explorers in a diverse, mixed ability group. On this two day trek across the countryside of Dartmoor, my group and I set off to find our first campsite - a small secluded patch of land next to a lake. The trek tested our endurance and ability to walk as a group. One of the hardest things we had to endure was the effects of the cold, insanely freezing temperatures, making simple tasks such as cooking and being able to coordinate the hands extremely hard. Another challenge was the size of our group and our individual differences; in order to maintain our group’s pace and speed we all had to support each other the best we could, being considerate of one another. As a result we came through and survived what seemed like an entire week, prevailing the frosty cold. The scenic routes were jaw dropping as we came to realise how beautiful Dartmoor really was and as we crossed forests and summits of hills we experienced the wilder side of the UK. After a long coach journey we finally arrived at Poole, where we would board the ‘Tenacious’. We had gone through so much that the entire boat journey felt all the more like luxury. The warmth, the food, the people, it was all new, all different. For the first few days on board, it felt like a paradise retreat; however, inevitably there would be work to come. We were set all the routine tasks that ensured the vessel functioned. This included watch duties day and night, the maintenance of the ship, cleaning and mess duty. Mess duty had to be the hardest of jobs, having to serve and feed the voyage crew. The captain avoided using the engine, so for most of the journey the ship operated through the manual use of the sails. 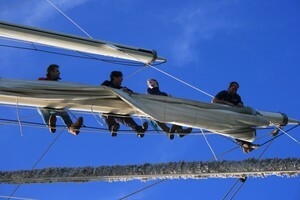 As a result work had to be put in, and every so often the entire crew would have to work the ropes in order for the sails to catch as much of the wind as possible. Difficulties on board appeared in many shapes and sizes, the most severe one I believe all of us had to face was overcoming seasickness. Ultimately the whole environment and ethos of sailing ‘Tenacious’ made the whole experience fulfilling and so much more special. Both the land and sea experiences will stay treasured in my memories. I learn ed from Infinity many important values, such as one from the two day trek on land when our amazing leader Tom taught us a lesson: “When you come to a dead end or a problem you can’t solve, just change one thing, one little thing and try again.” By a little innovation and persistence you are able to change the course of your dilemma and get closer to finding the solution. The lesson proved its worth as I still to this day haven’t forgotten it. Meeting people with disabilities was a life changing experience for me. I saw that these people less fortunate than I, didn’t seem to be less fortunate at all; their disability was merely an inconvenience which they had to adapt to and work around whenever it held them back, it was just something that was a part of them. It didn’t seem to stop them from being incredible. This was the closest I came to meeting people with real superpowers. From these amazing people I came to really admire the human capacity for adaptation and the perseverance. I became closer to people I had been in school with for such a long time and got to know them in a different way that I would never have been able to otherwise. As friendships grew, the more the roughness of the sea became bearable. From these expeditions I find myself becoming less and less materialistic. I feel as though I have become more genuine as I encounter the world around me outside of the environment created by us for us. It made me realise there’s more worth to life than pursuing the next iPhone or the big thing in our globalised society. I came to appreciate the freedom of not having a phone, one of the regulations I love about the BES. This freedom clears your mind from the cluster of the irrelevant information we bombard ourselves with daily. It not only allows you to feel free but it allows you to feel alive on another level, a more meaningful level.